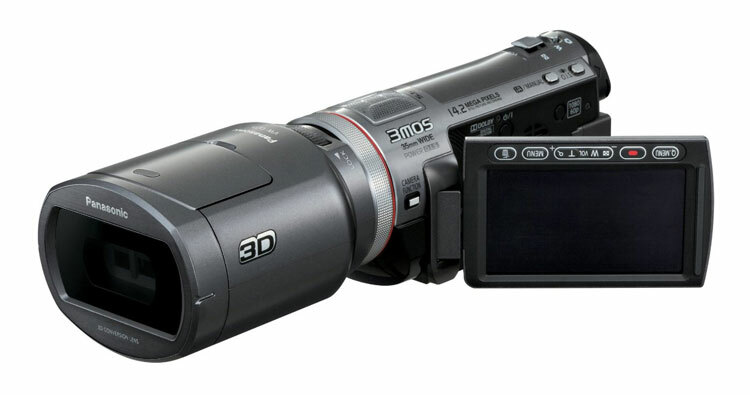 Panasonic's HDC-SDT750 HD adds a 3D lens to a solid 2D Full HD camcorder. While it was a worthwhile experiment, unfortunately the overall results are far from stellar—especially in 3D. Can’t find a good 3D movie to watch on your new 3D HDTV? Make your own—or so say the good folks at Panasonic, Sony and other camcorder makers. The third dimension has hit home video in a major way in 2011 and whether this is a good thing, we’ll soon let you know. Without the 3D conversion lens, the camcorder has a 12x Leica Dicomar zoom. As part of a new trend we like very much, it has a much wider opening focal length of 35mm in video, 38.8mm in still mode. The 35-420mm range is a good one and more than enough for all-around use. Also on the front are a flash and an AF Assist lamp. Since it has a 3-inch touchscreen LCD on the left side, there are a minimal amount of buttons (thank goodness). On top is the wide/tele zoom toggle along with a shutter button for shooting stills. Also here is a 5.1-channel surround mic – a real plus for anyone with a home theater audio system. On the right side are an adjustable strap, a mode dial (camera, video, playback) and a compartment for the shoe adaptor for optional lights. On the left side are buttons to switch between Intelligent Auto/Manual, to vary the type of optical image stabilization and Camera Function to also get into manual. Open the LCD (rated a should-be-better 230K pixels), you’ll find the on/off button and another to get you into 1080/60p (rather than i) recording. More on this in a bit. The lower bezel of the LCD has a number of controls including record, W/T for the zoom, Quick Menu, Menu and Delete. The menu system is straight forward and there’s no need for the supplied stylus as tapping fingertips on the screen work just fine. On the body is a speaker and compartment for the optional SD card and mini HDMI, USB and A/V multi connector outs. The back is home to a clunky-looking battery with that annoying text, a pull-out EVF with diopter adjustment and a classic record button that rests under your thumb. The battery lasts only an hour so a spare would make a lot of sense if you were to buy this camcorder. We have to give Panasonic credit here—the only thing missing is a Class 6 or greater SDHC/SDXC card. You get the battery, adaptor, remote, plethora of cables including mini HDMI, a stylus pen for the touch screen, a shoe adaptor and a 176-page owner’s manual. The 3D conversion lens has its own carrying case and caps. The software CD-ROM has HD Writer AE 2.6T software for editing and burning discs.